I decided to start off the week with an easy card that isn't too hard to understand. Basically, this card can be used as a counter against premature burial, call of the haunted, magician of faith, mask of darkness, etc... Of course that is assuming that no rule changes will be made to prohibit this. The cards I listed are very popular right now and almost in every single deck. 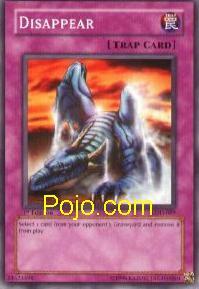 That makes this card very versatile and you'll make a use out of it against most deck types. However, there is the question of space in your deck. This card isn't going to do much for you if you need to clear the opponent's field, or draw a monster to finish off the opponent. I give it 2.8/5. It's a card that you're going to have to test for yourself to see if it's useful. I personally feel that my deck did not really require this card and that it was just taking up space most of the time. What a terrible card. Even though Soul Release isn't as fast as this, it's a much better Side Deck card. Disappear doesn't even begin to compare. Sure it can stop your opponent from getting a particular Monster via Monster Reborn, Premature Burial, and Call of the Haunted. But that doesn't even begin to make it playable. Even the fact that it can potentially hinder Skull Lair or Bazoo the Soul-Eater doesn't make it worth the slots in your deck. In the end, it's still only one card that you're removing from the game. You're not getting enough out of the card. The fact that it's a Trap means that it's very vulnerable. Soul Release, or to put it another way, a quick play mini Soul Release. it stands it isn’t going to be too much of a help when you need it most.